The second reason to fish near the channel is bait. Larger fish want bigger bait. The most common baitfish of any consequence in the Bay right now is menhaden. Since they migrate toward warmer water just like rockfish, by late November they are well on their way toward their comfort zones farther south. That means there is less and less bait in the upper reaches of the Bay and the biggest concentrations of menhaden are now near the channel. 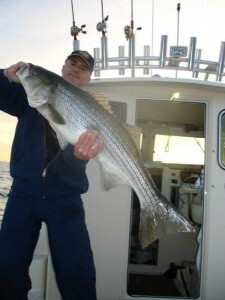 That’s perfect conditions for big stripers because they can hang out in the deeper warmer water and still ambush big bait. That doesn’t mean they’ll bite anything you throw at them though. Well, maybe the smaller fish will, but there’s a secret to getting the trophies. Read More! 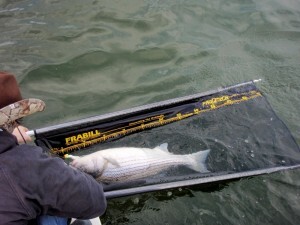 I’ve mentioned in previous reports that there are an extraordinary number of striped bass in the Bay this winter. It’s never been unusual to find a few big fish here and there during cold weather, but each year there seem to be more nice fish wintering over. I’ve managed a couple of trips this week with very good results as you can see in the photos below. Curious about why there are so many January rockfish, I put the question to Maryland Department of Natural Resources Senior Fisheries Biologist “Rockfish” Rudy Lukacovic when I ran into him at the Boatyard Bar & Grill in Annapolis one evening this week. Rudy thinks it’s all a part of changing migration patterns. He also noted that there have been fewer fish in the usual wintering grounds off the coast of the Carolinas in recent years. Read More! My sons Jacob and Daniel are visiting from Tennessee this week. 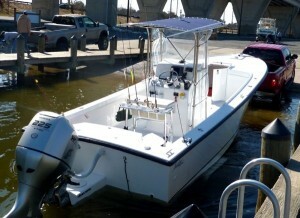 We’ve been trying to work a fishing trip into our schedule, but we couldn’t get it all together until today. Read More! I can’t remember when I first learned to make fishing lures, but it seems like I’ve always made them. Some of my earliest childhood memories include the times my brothers and I spent with our father in his garage workshop in the hills of Tennessee. There were always lures lying around in various stages of creation. Dad melted a lot of lead and made a lot of plastic worms. I’ll never forget the terrible smell of that little shop. Sometimes the smoke was so thick from burning plastic that you could barely see a foot in front of you. I don’t know how any of us survived the noxious fumes. My dad also poured his own jigs, tied his flies, carved cedar plugs and experimented with more fishing contraptions than you can shake a jig pole at. I still have some of his creations. I usually don’t fish with them, but I keep them lying around my shop here in Maryland. They fit right in with the dozens of half-made lures I hope to finish some day. 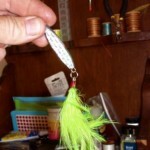 Following up the previous article on basic vertical jigging techniques, I want to share what I know for kicking it into the next gear. Most of these methods are a natural progression from vertical jigging. Jigging is an extremely productive method for catching Chesapeake Bay rockfish, so it’s something you’ll want to practice and learn well. Most of my techniques have been honed over time by bass & striper fishing in fresh water situations. 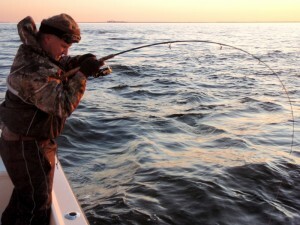 Bay fishing is similar in many respects, but there some special considerations. 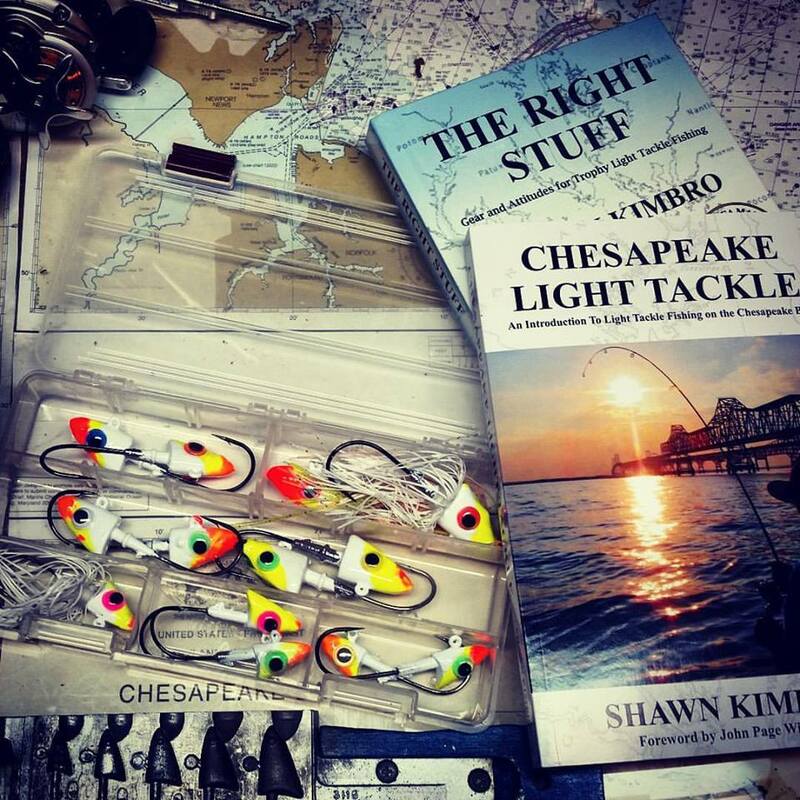 The Chesapeake Bay is very shallow compared to many striped bass environments. While suspended fish are occasionally encountered, it’s more likely that they are either feeding on the surface or holding near the bottom. Read More!